Space-funding company Uwingu will beam nearly 90,000 messages to Mars on Nov. 28, the 50th anniversary of the launch of NASA's Mariner 4 Red Planet mission. Radio telescopes will beam tens of thousands of messages to Mars this Friday (Nov. 28) to help celebrate the 50th anniversary of Red Planet exploration. On Nov. 28, 1964, NASA launched the Mariner 4 spacecraft, which seven months later completed a historic flyby of Mars and returned the first close-up photos of another planet ever taken from deep space. Mariner 4 captured images of a dry and desolate world, dashing the hopes of some folks who regarded the Red Planet as a potential abode for extant life. 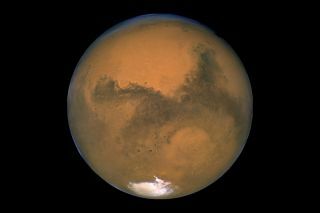 "Beam Me to Mars" invited the public to make their own contributions to the transmission for a fee, which ranged from $4.95 for a name to $99 for a long message and an image. Submissions were open from Aug. 19 through Nov. 5. Uwingu's transmission partner, Universal Space Network, will beam the messages to Mars shortly after 3 p.m. EST (2000 GMT) Friday at a rate of 1 million bits per second; they'll arrive at the Red Planet after a deep-space journey of about 15 minutes. Uwingu will use the money generated by the project to fund space science, exploration and education, company representatives said. The company also plans to deliver copies of all the "Beam Me to Mars" messages to Congress and NASA Headquarters in Washington, D.C., as well as the United Nations in New York City, to show policymakers how important space exploration is to the public. "We want to make an impression on leaders," Uwingu CEO Alan Stern, a former NASA science chief, told Space.com in August. "The more messages, the bigger impression it makes. If this thing goes viral, and it becomes the thing to do, then it'll make a huge impression." You can learn more about "Beam Me to Mars" and Uwingu at www.uwingu.com.